One day we had an opportunity to take our interns to lunch. 11 of them. We love our interns. We call them 'the kids'. Some even call them 'our kids' (Yes folks, most of us are THAT old). Our interns remind us how great it is to be young: Full of energy, the future is right ahead of you, and you think you can do and achieve anything and everything. They are after all a glimpse of our country's future. "Which one of you think Indonesia will be a better country 10 years from now ?" Nine of them raised their hands. The other two shook their heads, citing corruptions as the culprit. So the majority of them are optimistic. That's great. "Do you know that according tho UNESCO, Indonesia's government spent THE LEAST money on primary education compared to ANY OTHER COUNTRY in the world?" We showed the kids the chart below (click image for bigger picture) and let them digest it. "Now, which one of you think Indonesia will be a better country 10 years from now ?" No hands this time around. Some even had problem swallowing the lunch. You see folks, our kids got it: Education is the future. If we invest too little in it, there will be no future. Our kids know it. We know it, you know it. We all know it. We all get it. Ask anyone you meet on the street and they all get it too. Isn't it funny that when we combine us all as a country, we suddenly just don't get it? "It's the government's fault, not ours", said one of our kids. Yes, but it's OUR government. We elected them. So in the end it's our fault. Is it not? We, the people, must know what we want and know how to demand it. "Which one of you voted in the last election?" we asked. All of them did. "Good. When you were at the voting booth, which one of you voted for the one (either an individual or a party) that you think will do a good job in education?" "Ok, it does not have to be education. It could be the economy, environment, women's right, anything. Which one of you voted based on the views on one of these issues?" Oh dear. And these are the well-off university-educated bunch of kids. The patriotic, optimistic, idealistic kids: And they voted without even consider these things? What were they thinking? Or maybe they are not as patriotic, optimistic, idealistic as they want us to think. So allow us to ask you, our dear fellow Indonesians: which one of you think Indonesia will be better off 10 years from now ? For more on education and other views on Indonesia, visit this site setup by our good friend Jakartass. And don't hesitate to contribute. Your voice counts. Wow. I've known many young Indonesians who would've answered your questions very differently. Sounds like you pick them from a wrong pool of candidates. Ever reconsider your recruitment process? (Hint: "well-off university-educated bunch of kids" are never a guarantee). Since HR receives a lot of application, the first screening would be to pick only graduates from top universities. As you said, this is never a guarantee, and we totally agree. But with many applications a month (we only take less than 2% of all applications), it is nearly impossible to even read them carefully one by one. Graduates from top universities are not special. Some are smart, but some are just plain lucky. For sure there are many smart ones who were not lucky enough to enroll to top universities. Probably HR just have no clue on how to find them. (that's our opinion by the way, not HR). You've pointed out the contradiction: "well-off university-educated bunch of kids" that did not consider much when they elected their representatives. 1. Your kids are just very small portion of our 130 mio which were lucky enough to study in the university. Popular issues like food for all, jobplace, rice price, are much more inviting than education (:send our kids to madrasah and that is okay, at least they wont be fooled when they go to the market:). So: common people perception on education. 2. Actually many of us do not know who are our representatives in the parliament. We just vote because we are asked to and want to be a good citizen. We do not want trouble in the country because only 40% go to voting places. About education budget: that is not even news, is it? I just shocked that it is so low. I.A. are seemingly too modest to say that their contribution - Education: is it all about the money? - can be found here. I personally think it would need more than 10 years for our beloved country to be better off. and we, as concerned citizens have to take matters into our own hands I am afraid. can't count on the government. the goal is to create citizens that will vote for the right people. qualified teachers are desperately needed to mold young minds so when it's time for them to vote, they would actually do it with wise consideration. - perhaps having national plus school teachers to share their expertise with teachers at government schools. - an act of corporate responsibility to..let say give funding for teachers to attend educational seminar of some sort. or even better, a scholarship. - and it would also be great if some of us, in the midst of our busy life, could spare some time volunteering at a local school to share our skills, maybe offer a short english course or something to the teachers. I know this is so close to impossible as many of us have a quite hectic life of our own, not all willing to sacrifice their time, and not everyone is good at teaching. oh, well.. guess I should stop day dreaming. but, there are foundations out there, such as Yayasan Tunas Cendekia (http://tunascendekia.org/wordpress/yayasan-tunas-cendekia/about-us/), which I think is a good example. And I believe there should be a similar foundation for teachers. where people could donate good educational books, books about excellent teaching skills. the foundation would be a mean for teachers to gain more knowledge. perhaps the foundation would work together with international schools. Oh, I don't know. I guess it takes a spark of kindness in our hearts to make it all possible. maybe there won't be any Indonesia in the future if we keep our primary education aside. It's not democracy really, it's idiocracy. how can i answer the question? u asked 10 years later?trust me if this 2009 presidential election come out bad crapy guy who dont know anythin about LAW and The People, this country will shredded into little pieces my friend. maybe you can say there will be united manado and republik palembang or maybe there's still indonesia but everytime u cross a border u have to pay Rp100.000,- for regional taxes. and probably Petronas and Shell gonna color your house and if you go back to bandung it will all green color by petronas. WE NEED OUR NATION IMAGE BACK AGAIN. Merah Putih, Pancasila, Dan Undang2. (i cant say 45 but 45 good enough). We Need an establish the new country image. (Maybe we all can learn by playing some sims game like Caesar 4 or Simcity to know whats best for us)Just dont let they sell Indonesia, its our Great2 grandfather that stand for the sake of this country. (WE NEED SMART LEADERSHIP AND NOT XENOPHOBIC) Think of it. come on guys, cut the crap of suharto and orde baru and lama. for heaven sake its a new world now, be professional and dicipline. malu diliat orang luar.kasian TKI2 kita yang kerja diluar.udah cukup korupsi dan bodoh2nya. pikirin orang kita, suku2 di negara kita. kasian orang yang dikampung kelaperan. They all hungry. Kakek2 mbok2 yang idupnya susah. Our govt spent that much too for decades, and we are not too bad...not too very bad, my fren. Many well-off university-educated colleagues of mine chose to work abroad because of better appreciation others give to them for their profesionalism. Brain drain. People accused them as deserter. I'd say they're smart. The rest of well-off university-educated colleagues of mine were on middle-top level management until they found that their fellow same level expat colleagues had higher appreciation than them. Those expats were neither smarter nor more proficient. Yap, simply because they were EXPATRIATE! So, you wonder why the well-off university-educated "kids" of yours cannnot answer your question? Because the ones who can answer it were out there looking for what they deserved.. deserve??? in term of what? money? position? good living??? Don't they need to look back to what happened in their homeland? Don't the strong message of a desperate cry for development really touch their heart deeply? If, let say, indonesia become a developed nation, what will they do? go back and here for money hunt? 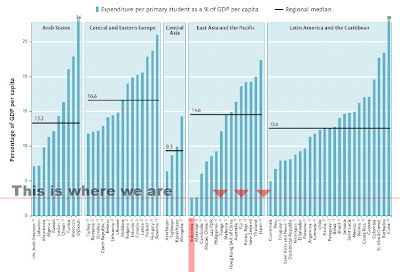 I may not agree with the statement that Indonesia is the country which spent the least money in education. It is better to say the least percentage of the annual income rather than the least money. 3% of Indonesia's income is most probably still higher than 40%of East Timor's annual income. Good point. But are we going to set our standard THAT low? I think, one option is to consider a non-existence of general election and Pilkadas. this will save much money, beside, pilkadas is proven to be useless except for making mess and conflicts. One reliable source said that 100 trillion rupiah was spent for simulatenous pilkadas. Not to mention the general election and presidential election. If you put the money wasted for campaigning, then the amount would be 2-3 times higher. Democracy? sorry..not for this republic.